A) Motivation for the Project: The three condo complexes have failing or challenged septic systems as evidenced by high water table, rocky soil and the requirement to pump the septic tanks frequently. Typically, the septic systems are expensive to refurbish or rebuild. It is likely they cannot be built to today’s standards for performance and code compliant reserve areas. Connecting with the municipal sewer system is a permanent solution. 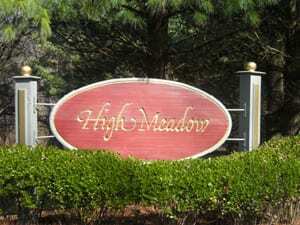 Faced with the potential of expensive repairs that are typically not guaranteed, the High Meadow Condo Association initiated discussions with the WPCA to sewer their area. The WPCA subsequently met with neighbor associations, Ledgewood and Newbury Crossing, suggesting a coordinated project. The septic situation is further exacerbated with the installation of Town water. Ground water is no longer being drawn for domestic use, so it has nowhere to go except to make the wetlands wetter. This puts an additional hydraulic challenge to the area septic systems. B) Routing Options: In the initial stages of the project several routes were considered. 1) Gather the waste streams and pump out to Silvermine Road. This option requires a new pumping station and an upgrade to the so-called Railroad pump station on Silvermine Road. This is now likely the best option, since costs for requirements to traverse wetlands are high making the cost on parity with Option 2 below. 2) Gather the waste streams and pump under the Railroad to Pocono Road in the vicinity of the Fire Station. This is requires a temporary disturbance of wetlands and a wetlands permit. It also requires a rather expensive easement requested by the Railroad. But it was potentially the lowest cost option. However, with the project designed and bid, the costs are about equal to Option 1 above. 3) Gather the waste streams and pump to Route 133. This requires a long run of new pipe on Route 133 and under the trestle painted bridge. This is the apparent highest cost option. C) Wetlands: With the focus on the Routing Option 2, work began to engineer the project. Most of the engineering needed to be completed to develop a complete Wetlands application. That is now accomplished. The Wetlands Commission has process the application from December 2012 with approval granted May 2013. D) Approvals: Projects of this nature require approval from the Board of Selectman and the Planning Commission to start a project. Subsequently, the Selectman and the Board of Finance must approve financing by bonds. Since this project exceeds $1MM, approval by Town Referendum is required by the Town Charter. All these approvals were secured with the final piece of a town wide approval completed May 2013. 1) The Ledgewood project has rudimentary distribution system, so connections need to be organized from each building rather than from collection tanks. 2) The Newbury Crossing system is well worn with age. The manhole casings and covers are severely deteriorated and need to be rebuilt. 3) The High Meadow infrastructure is in good shape and can be used. However, it was necessary to re-route the original proposed scheme with the finding of a vernal (temporary) pool adjacent to the original proposed routing. F) Cost Estimating: With borings taken sufficient to complete a more thorough analysis, it was possible to generate a more accurate cost estimate at a higher confidence level. This gives a preliminary look at the likely Benefit Assessment rate. However, the full cost of working in the wetlands was still in question. G) Bidding the Project: With Wetlands Commission approval required conditions were finally known in May 2013. The wetlands portion of the project went out for competitive bid in June. The costs were far higher than projected. The WPCA took the option to reject all bids at the regular August 2013 WPCA meeting. The work went forward has been to prepare bid packages for the lowest cost option—a route out to Silvermine Road. The bid package was issued May 2014 and awarded in June. H) Construction: The easiest part of the project may be to do the actual construction, which started in August 2014. It is anticipated project construction will be completed before the end of 2014, then touch up work the first half of 2015. Jan 2014: Present engineering details for the modified route to the Inland Wetlands Commission. Feb 2014: Finalize competitive bid package, review and approve. Apr 2014: Send the complete engineering project specification package out for competitive bids. Jun 2014: Award bid to lowest competent bidder. Aug 2014: Start construction. This will include informational meetings for affected condo associations. Aug – June 2015: Construction underway. Progess will be from the lowest point in High Meadow upward to Ledgewood. Sewers will be activated as the project proceeds and septic systems are decommissioned. May 2015: Finalize project costs and assign Benefit Assessments. Jun 2015: Benefit Assessment Public Hearing. Sep 2015: First Benefit Assessment billing.